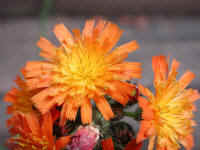 (Hawkweed, Orange (Hieracium aurantiacum or Pilosella aurantiaca) - 01) Orange hawkweed are a native of the alpine regions of Europe that was transplanted to North America, where in can be found in the northern United States, including Alaska, and southern Canada. 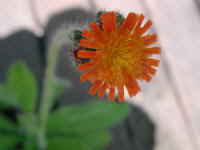 Orange hawkweed is a member of the aster family (Asteraceae). (Hawkweed, Orange (Hieracium aurantiacum or Pilosella aurantiaca) - 01a) Each flower head of the orange hawkweed is about 3/4 of an inch across. The bloom is really a composite of many over lapping concentric circles of individual ray flowers. The petals are flat at the terminal end with five points that somewhat resemble a 5-tined fork. (Hawkweed, Orange (Hieracium aurantiacum or Pilosella aurantiaca) - 01b) This is a bee's eye view of the many of the individual flowers, with their stamens and pistils, that make up the bloom of the orange hawkweed. (Hawkweed, Orange (Hieracium aurantiacum or Pilosella aurantiaca) - 02) This is another view of the terminal cluster of flowers on the long stem of the orange hawkweed. 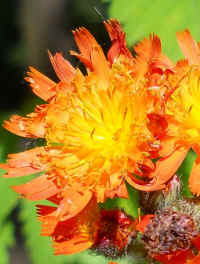 Cattle would not eat the orange hawkweed growing in their pastures because of the hairy nature of this wild flower, thus farmers called it the devil's paintbrush, because it ruined good pasture land. We can also look at this flower in another way; if we ate only a plant food diet, as God originally intended, then we could enjoy both the beautiful animals and wildflowers living together in the fields. (Hawkweed, Orange (Hieracium aurantiacum or Pilosella aurantiaca) - 02a) From our own observations of this beautiful wildflower, it appears that the outer ray flowers are male and the inner flowers are female. 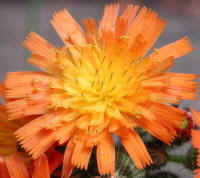 Note that the outer flowers of the orange hawkweed have curled stamens with pollen grains, and that the inner flowers have Y-shaped pistils. Also note that each flower has two petals, a longer bottom one and a shorter upper one, with the stamen or pistil protruding out from between them. 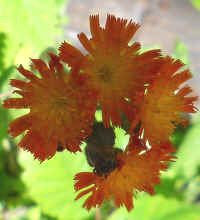 (Hawkweed, Orange (Hieracium aurantiacum or Pilosella aurantiaca) - 03) This is another view of the terminal cluster of orange hawkweed flowers that we found growing in a planter on our sun deck in Greene County, New York, a county that had no previous reports of having this beautiful wildflower. 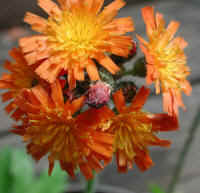 (Hawkweed, Orange (Hieracium aurantiacum or Pilosella aurantiaca) - 04) This is another orange hawkweed that is just beginning to bloom. 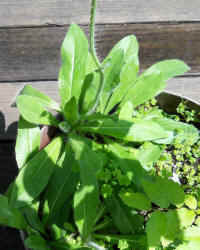 Other flower buds can be seen poking out from behind the flower. 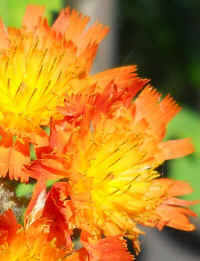 Orange hawkweed can grow to heights of about two feet. 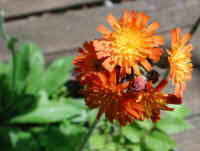 (Hawkweed, Orange (Hieracium aurantiacum or Pilosella aurantiaca) - 05) We took this photo of the orange hawkweed because of the contrast in the coloration between the sunlit and shaded portions of the flower. (Hawkweed, Orange (Hieracium aurantiacum or Pilosella aurantiaca) - 06) This is another look at the terminal cluster of blooms on the orange hawkweed. 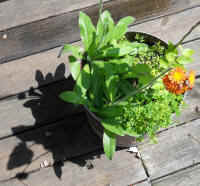 (Hawkweed, Orange (Hieracium aurantiacum or Pilosella aurantiaca) - 07) There are two orange hawkweed plants growing in this pot on our deck. These wild flowers reproduce in two ways: connectively in the ground through their fibrous roots and shallow rhizomes, and through their wind-dispersed seeds. 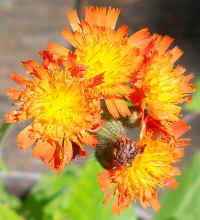 (Hawkweed, Orange (Hieracium aurantiacum or Pilosella aurantiaca) - 08) The orange hawkweed has a basal rosette of elliptical to lanceolate leaves 5–20 cm long and 1–3 cm broad. The flowering stem is usually leafless or with just one or two small leaves. 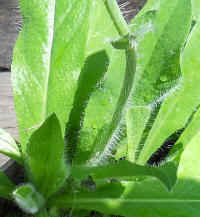 The stem and leaves are covered with short stiff hairs. (Hawkweed, Orange (Hieracium aurantiacum or Pilosella aurantiaca) - 08a) This is a closer look at the hairy leaves and stem of the orange hawkweed. In the upper portion of the photo, we can see a small stem leaf. In the bottom of the photo, we can see a new stem with a terminal cluster of buds starting to grow. 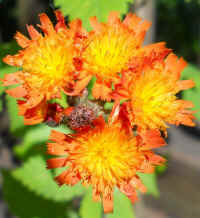 (Hawkweed, Orange (Hieracium aurantiacum or Pilosella aurantiaca) - 09) This is another look at the terminal flower cluster of the orange hawkweed, which we photographed on 19 June 2013 in shadow to highlight the contrast between the flowers and the bright sunlit background. 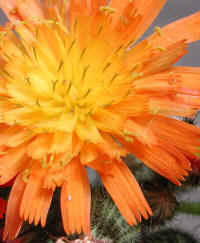 The entire bloom is only about one inch across, and each composite flower is only about 1/2 inch across. 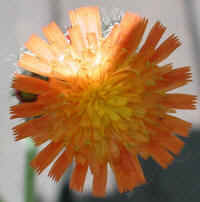 (Hawkweed, Orange (Hieracium aurantiacum or Pilosella aurantiaca) - 10) This is the same orange hawkweed flower cluster shown in the previous photo, but this time it is on full sunlight. 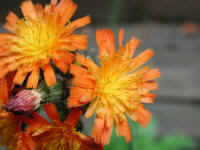 (Hawkweed, Orange (Hieracium aurantiacum or Pilosella aurantiaca) - 11) We are always amazed and delighted at the myriad of detail that God created into His wildflowers. 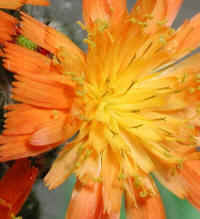 We can choose to see the beauty in this wildflower, or miss the blessing it brings, and only see the orange hawkweed as a noxious weed, as some government agencies would have us do. But as for us, we will always be blessed by the beauty in all His creations, and see these plants as the wild flowers God created them to be. 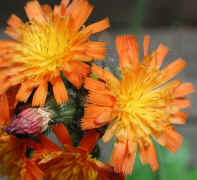 (Hawkweed, Orange (Hieracium aurantiacum or Pilosella aurantiaca) - 11a) In this close up side-view photo of the orange hawkweed, we get a good look at the pistils of the central disc flowers of these magnificent wild flowers. We don't understand how anyone could fail to see God handiwork in this flower, and give credit to the devil by calling it the devil's paintbrush. (Hawkweed, Orange (Hieracium aurantiacum or Pilosella aurantiaca) - 12) By comparing the blooming flowers with the dried up ones below that have gone to seed, we can see that the ray flowers have shriveled up and mostly fallen off leaving only the maturing disc flower ovaries to finish developing their seeds.